"When I was a schoolboy we were taught that the England of 1215 was a degree or so warmer than today. And vineyards were sown as far north as the Isle of Ely... a stones throw from where the University of East Anglia Climatic Research Unit stands today, the Climategate guys, so I will take global warming seriously when they tear down the Climate Research Unit, and sow a vineyard making an amusing little Chateauneuf du Phil Jones." 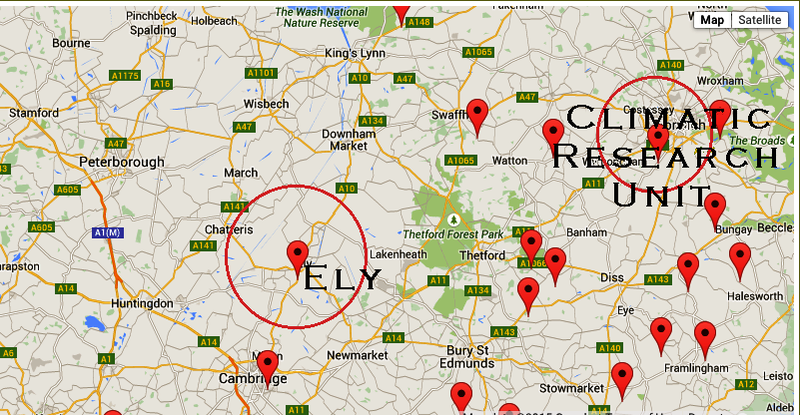 "the England of 1215 was a degree or so warmer than today. And vineyards were sown as far north as the Isle of Ely..."
the present production of wine in Scotland if anything demonstrates today's British climate to be "a degree or so warmer than...1215." Next, he'll be telling us Erik the Red sailed West in search of fresh mango juice. 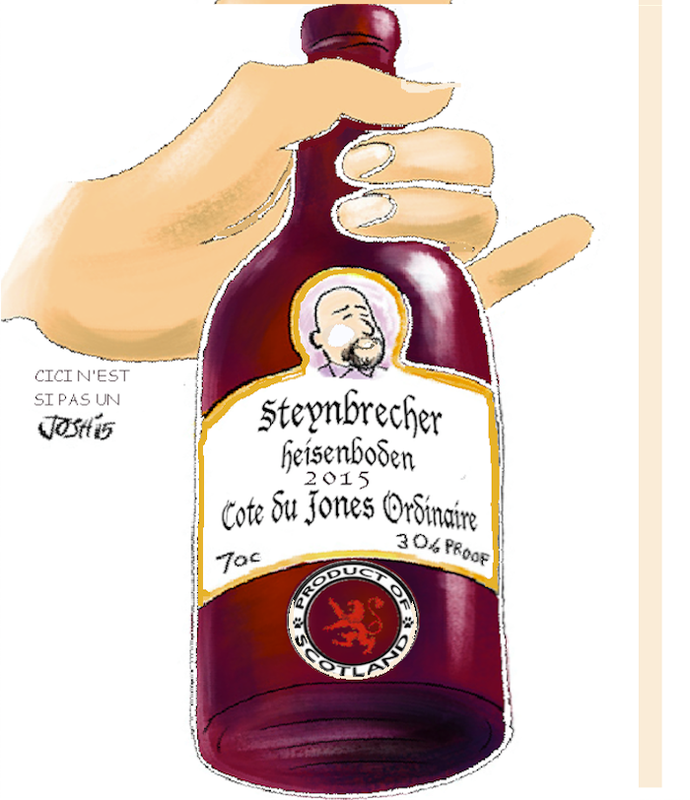 Steyn's counterfactual tasting notes bode ill for his libel trial : grapes never grew in medieval Greenland , but the Industrial Revolution did happen, and global warming in its wake has pushed British winemaking north through grim Northumberland into, Heaven help us, Scotland! While Steyn makes crapulent claims about winemaking in Greenland, and charges those who doubt Vinland voyages prove global medieval warming with suppressio veri, canny Scots vignerons have been busy establishing vineyards closer to the Arctic Circle than the Isle of Ely.
" There is documentary evidence that the monks at the Abbey and later the Cathedral at Ely cultivated vines right through the Middle Ages "
To the dismay of deniers touting an erstwhile "pause," 2003 saw Burgundy's earliest harvest since record keeping began in 1370- Chandon's Corton Charlemagne was picked on August 15, the grapes having already ripened to the heady limit of fermentation- the wine was bottled at 14.5% alcohol! 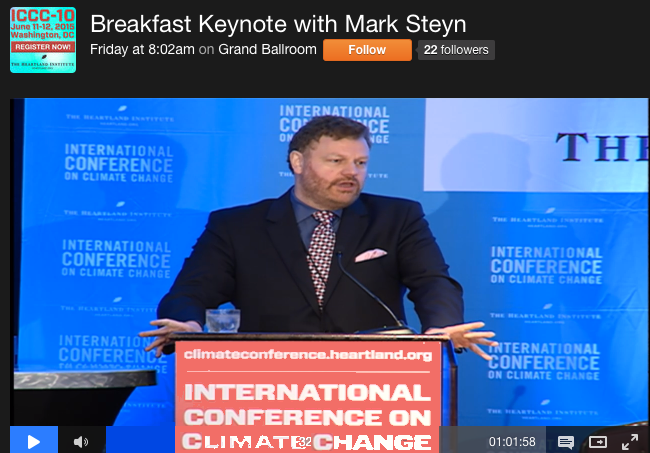 Like many ersatz climate skeptics, Steyn has his history backwards; the medieval warm period simply wasn't warm enough to grow wheat, let alone grapes, in Iceland or Greenland, witness how clerics there were forced to celebrate mass with items as alien to The Last Supper as oatcakes, ale and fermented crowberry juice. Hearing of this heresy in 1237, Pope Gregory IX told Archbishop Sigurd of Norway to order Greenland and Iceland's clergy to import the real deal in sacramentals--panis de frumento et vini de uvis from warmer climes, a description met by today's brae wine frae north o' the Doon. While it's naughty of Mark to ignore Little Ice Age winemaking in Nova Scotia, I can't fault Matt Ridley leaving his Northumbrian coal-lands vineless : plantings on equally bituminous acres this side of the pond produce haggis-friendly wines with a scary witch hazel nose and terrifying hydrogen sulfide finish. But for all the ginger he puts into it, Mark Steyn's fortified hogwash merely strengthens the case for The Medieval Cooler Than Now Period. to the rise of classical theoengineering. 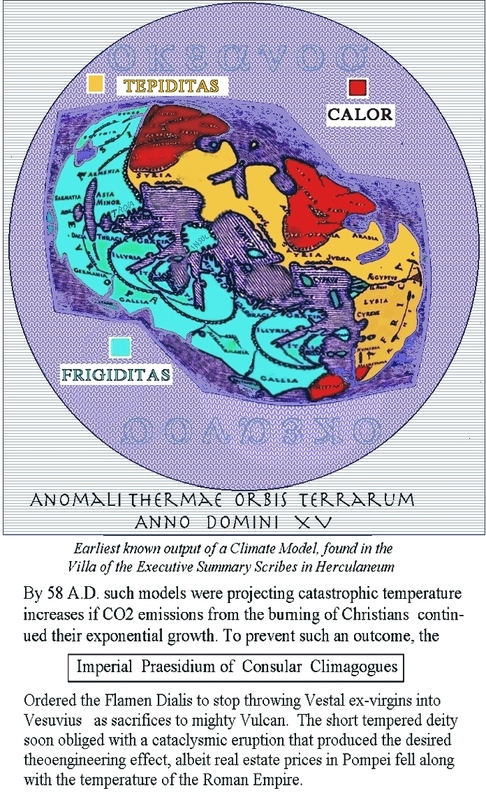 It depicts the first known climate model, a MLXXX-P resolution wax tablet of the flat Earth, apparently produced by reading FORTRANUS code aloud to a cohort of slaves operating a multiprocessor abacus.